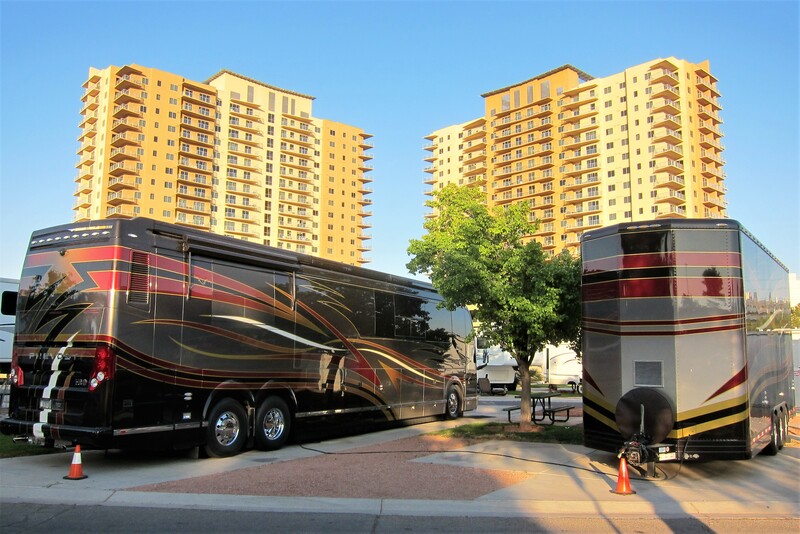 Sunday, April 2 through Wednesday, April 5, 2017-Nellis AFB, Las Vegas, Nevada: This RV park in North Vegas is our go-to facility when we want to be near our daughter and her family but not too close as to interfere with their weekday routines. 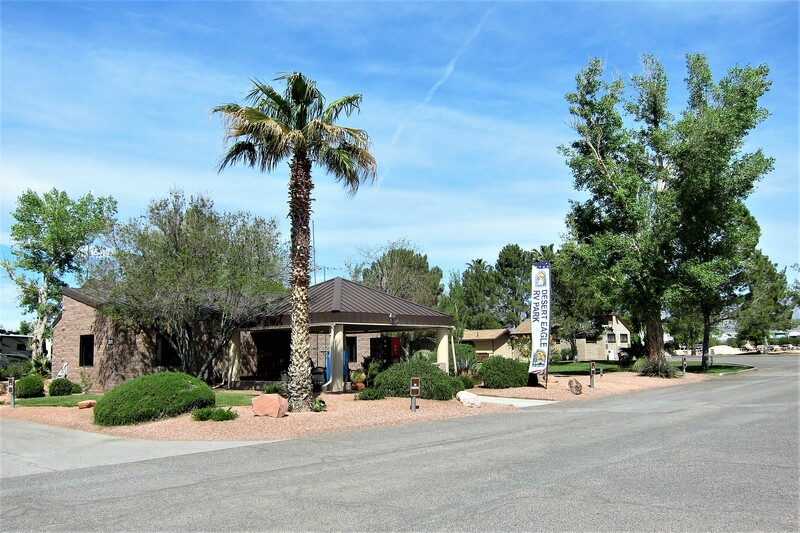 Desert Eagle, as it is called, has always been one of the top rated military RV Park’s in the system and is consistently at near full capacity. Since Kit and I rarely make advanced reservations, we usually are relegated to an older partial hook-up site, as we were during this stay…or to the no hook-up area of overflow, which is basically a large dirt parking lot. 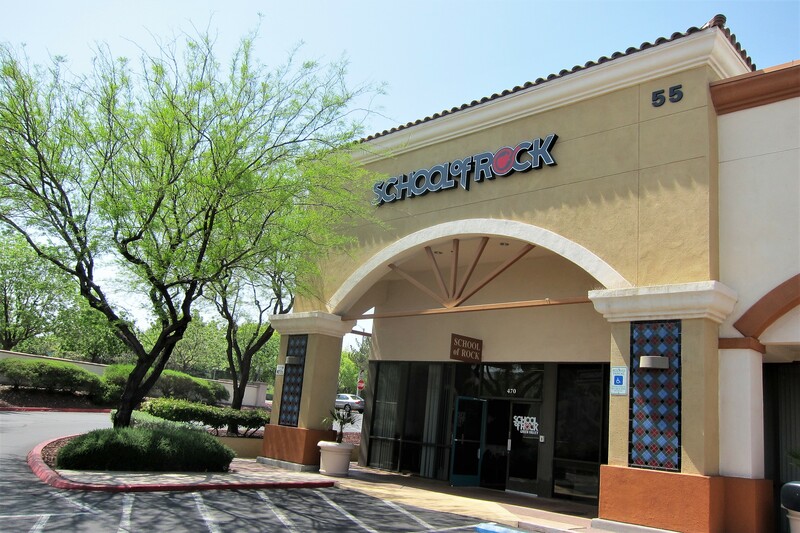 Fortunately, Desert Eagle is undergoing a major expansion this year that will nearly double their campsites, so on future trips we may be able to score a full hook up spot! Kit and I spent most of our down time while at Desert Eagle doing chores…cleaning the road grime and suicidal bugs off the RV, vacuuming up the dust from our wind storm experience, attending to some administrative issues and shopping for kid friendly food for the upcoming Jack and Tucker Spring Break Adventure. We also relaxed bit enjoying the reprieve from the road and the spectacular sunsets. 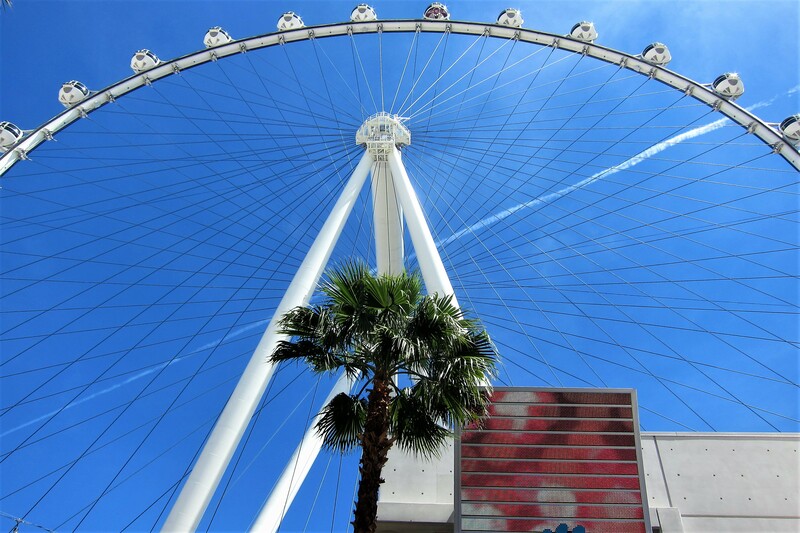 On April 4th, which happened to be someone’s 70th birthday, said someone wanted to go down to the Vegas Strip and ride a Ferris Wheel…but not just any old wimpy Ferris Wheel…nope, the largest Ferris Wheel in the world! 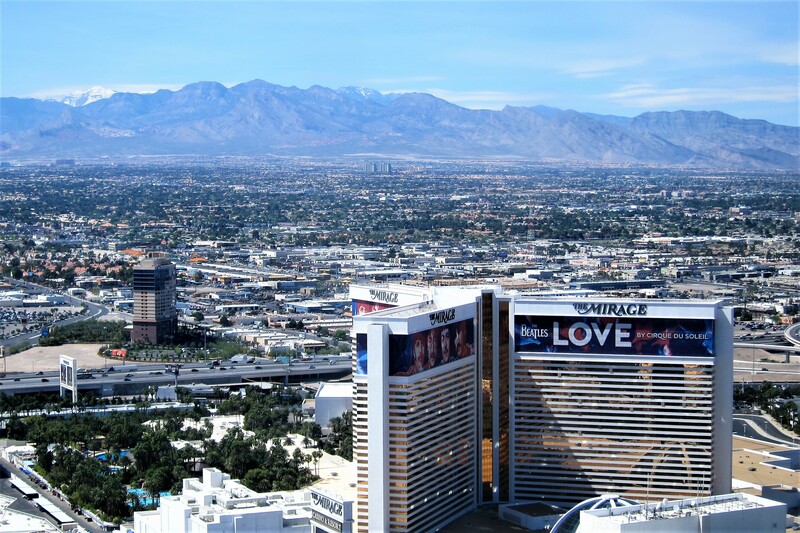 The High Roller is a 550-foot-tall giant that towers over the Las Vegas strip. 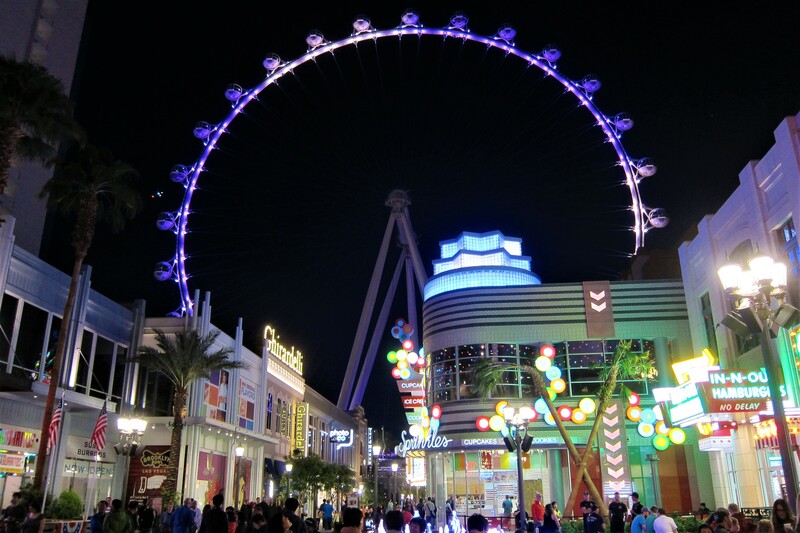 Built in 2014 by the Caesar’s Palace folks to anchor their new destination shopping, gambling, and dining plaza called LINQ, the High Roller features 28 “Passenger Capsules”. Each 22-foot diameter capsule is capable of carrying up to 40 folks while it makes a thirty-minute round (no pun intended) trip rotating on a vertical axis to keep the floor of the capsule horizontal to the horizon. And as expected, the views are spectacular! Full size automobiles look like little toy Matchbook cars! 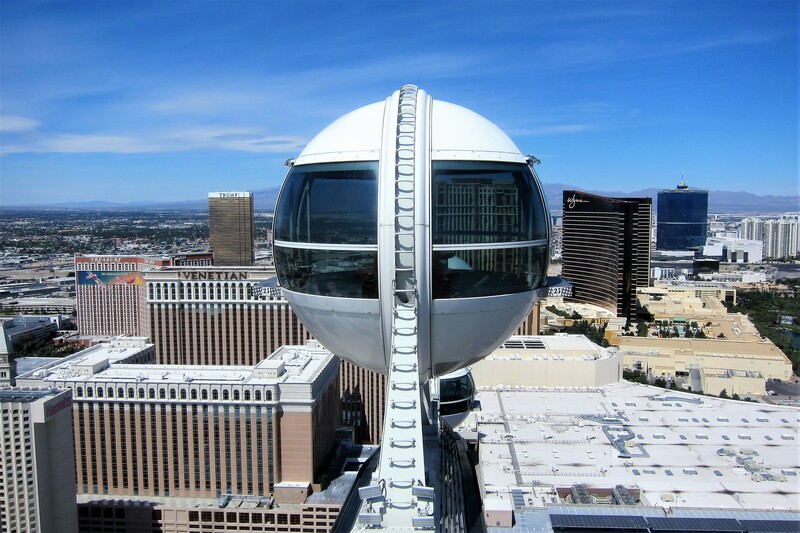 However, the ride is mesmerizing, and as smooth as glass…speaking of which much of the Passenger Capsule is glass! What a thrill! 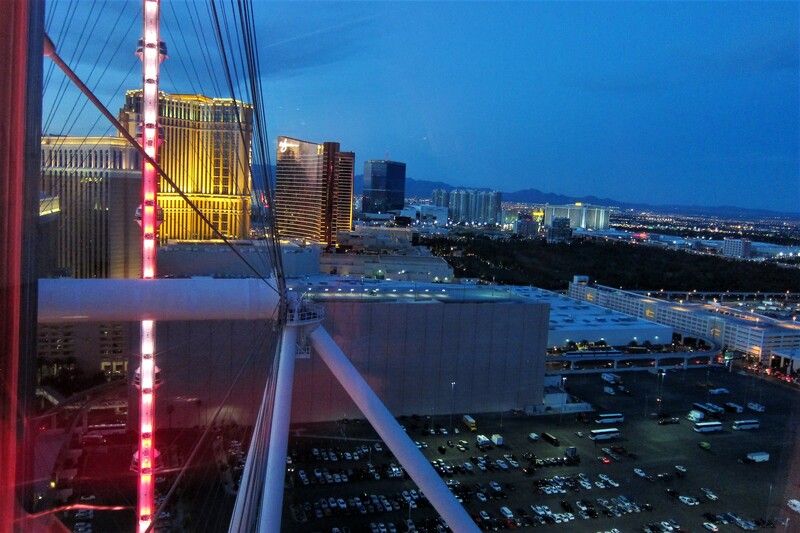 If your travels ever find you in Las Vegas, check out The High Roller, it’s an unforgettable experience! Next on the agenda for the milestone birthday boy was a walk about a nearby car dealership, The Auto Collection. 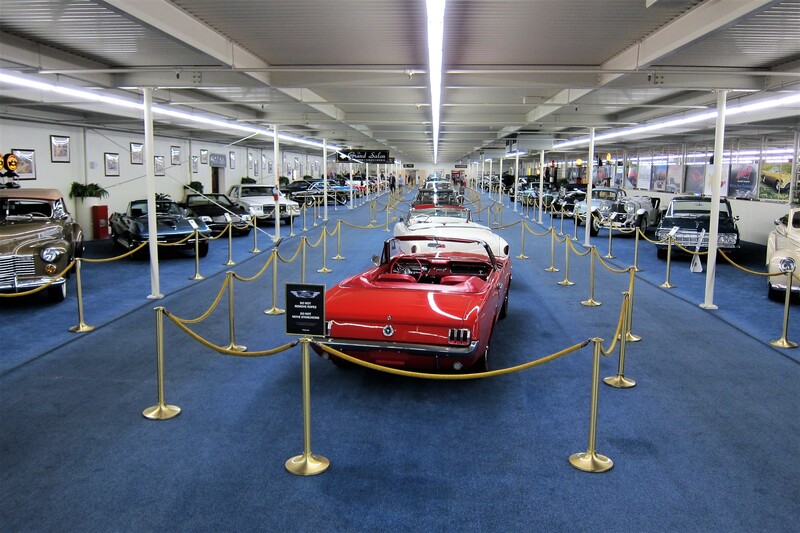 Located on the fifth floor of the Imperial Palace Hotel, this 125,000-square foot auto dealership contains over 250 classic automobiles, most of which are for sale! MSRP’s range from $30,000.00 to several million for the rarest examples on the lot. 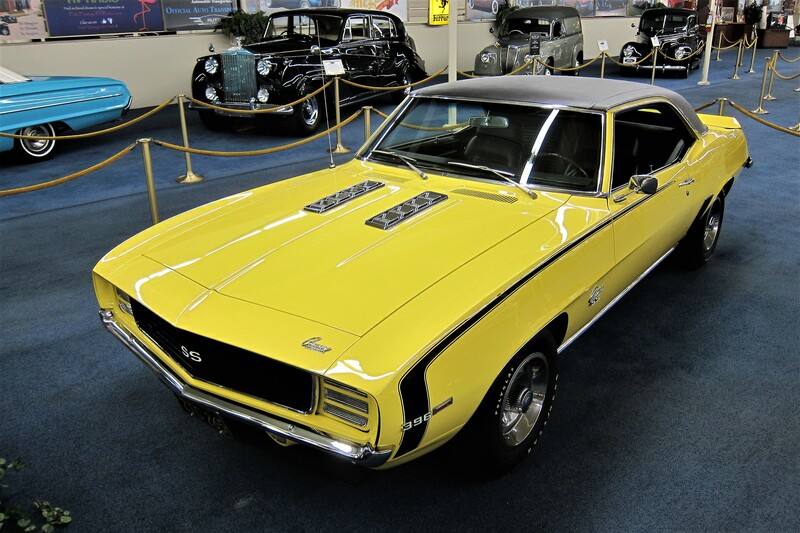 Some of my favorites were the 1969 Camaro SS/L78 at only $85,000.00. And a rare 1967 Shelby Mustang GT500. 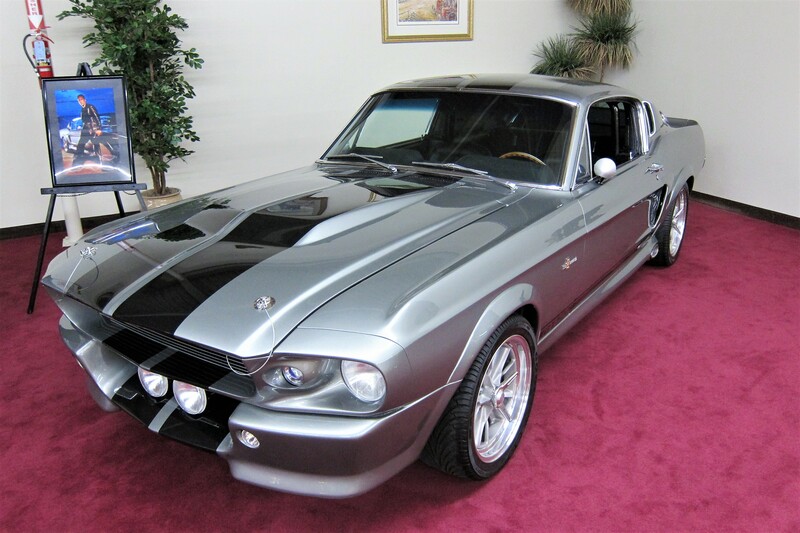 This is the famed “Eleanor” from the film “Gone in Sixty Seconds” …a steal (pun intended) at only $1,300,000.00! 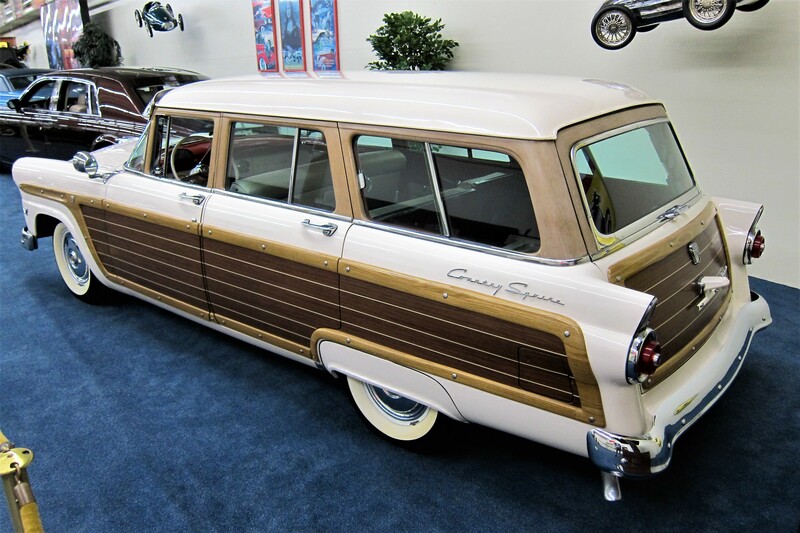 A sentimental favorite of mine was this classic family car…a 1955 Ford Station Wagon. Surprisingly, it wasn’t for sale!?!? Must be a sentimental favorite of the dealership as well! Spent a lot of time riding in that buggy going on motor trips to the mountains or hauling the neighborhood kids to the beach. 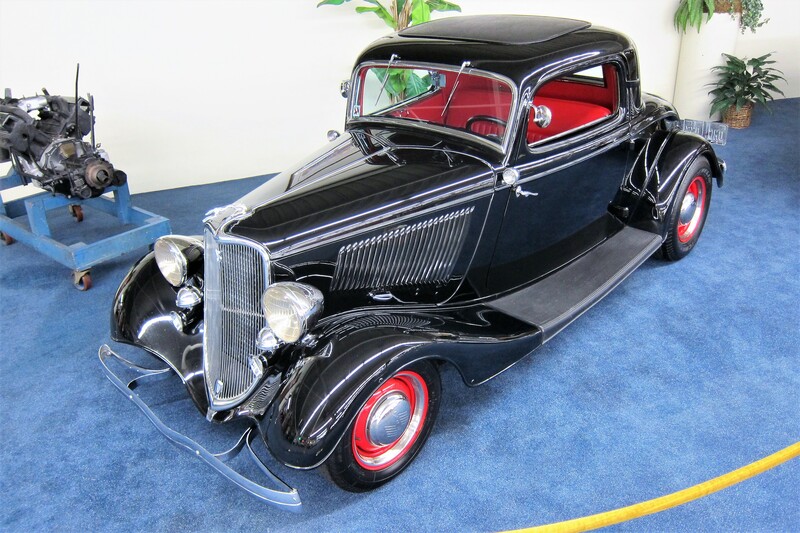 Also, I drooled over this 1933 Ford 3-Window Coupe! A classic design, the resto-rod has been updated with modern drive train…and this creampuff can be yours for only $85,000.00! Also, there was this plain looking sedan. 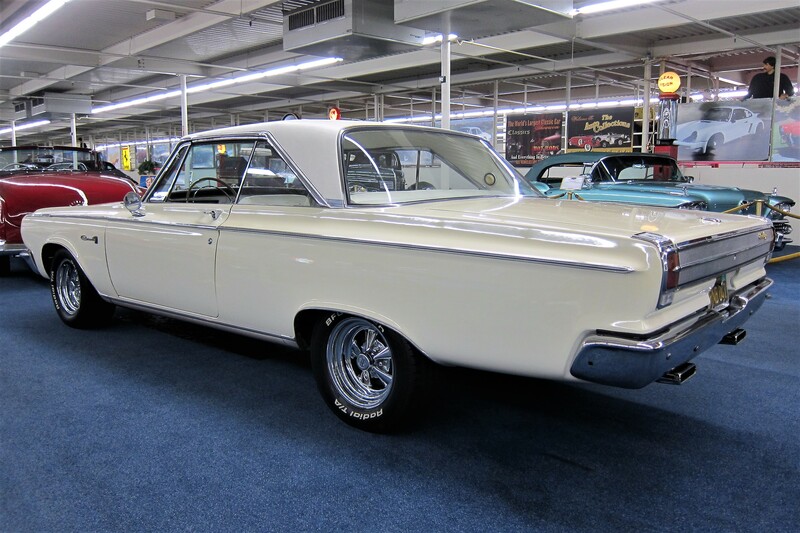 A 1965 Dodge Coronet two-door sedan, this rather pedestrian looking (no pun intended) automobile is a real “sleeper” with its original 383 CID engine modified to produce over 500 horsepower! And with an asking price of $32,500.00 relatively affordable as well! While I was enjoying the many cars in the collection, Kit was enjoying some much needed “Retail Therapy”. 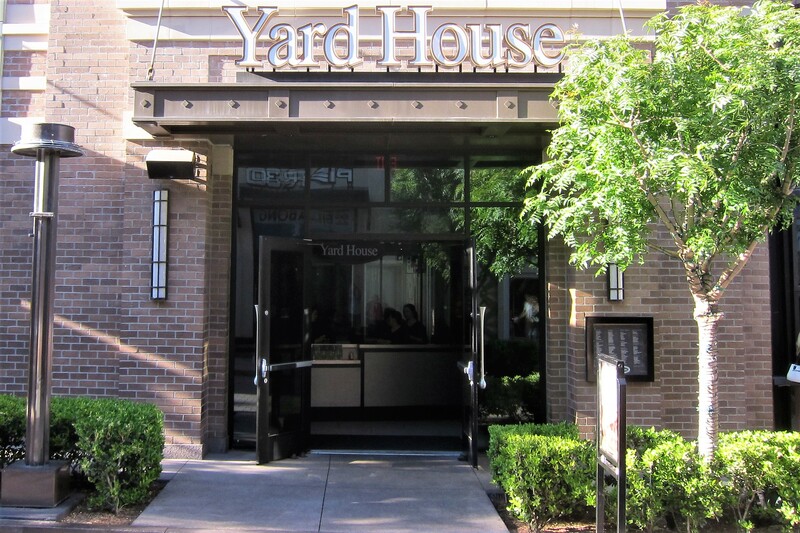 Eventually we reconnected on the LINQ Plaza and wandered into a nice brewpub called The Yard House. Where we enjoyed a late afternoon lunch and a few of the tavern’s barley pop’s! 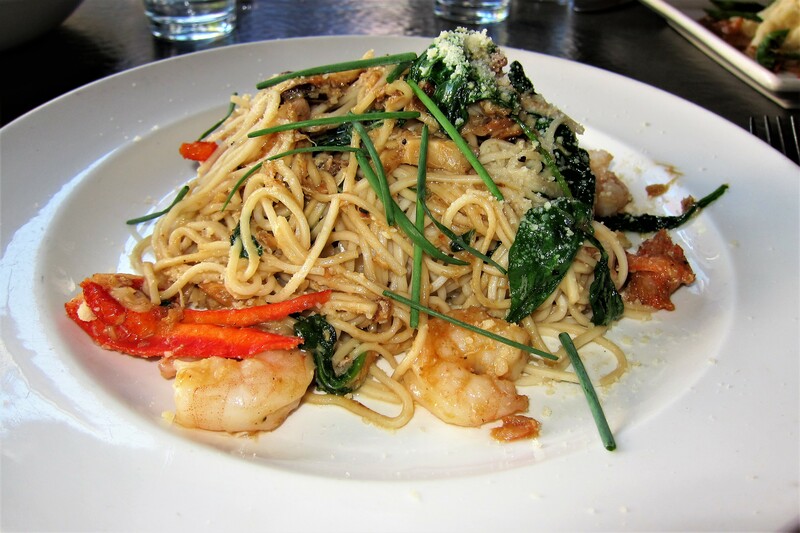 While I indulged in the shrimp, crab and lobster noodles. Which paired well with a vintage Porter. The food and drink were fantastic! Relaxing over coffee, we discussed what to do next. 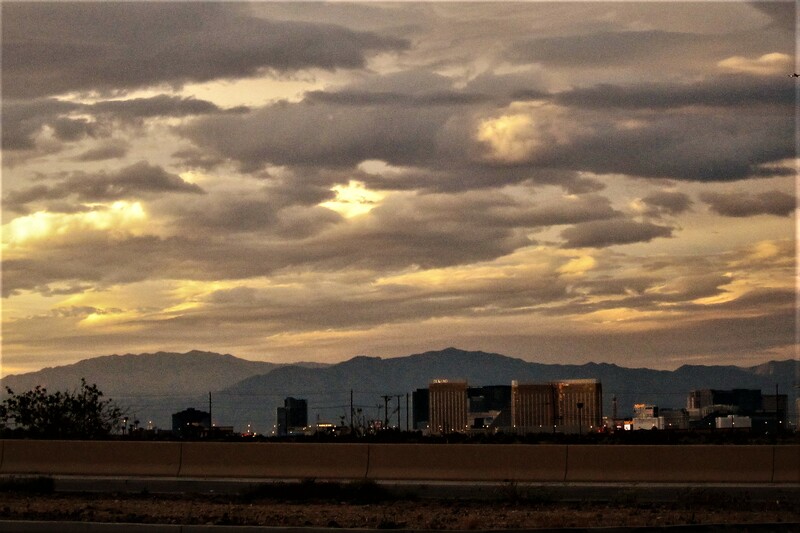 Since it was getting near dusk we (I…the birthday boy) decided to ride The High Roller again. 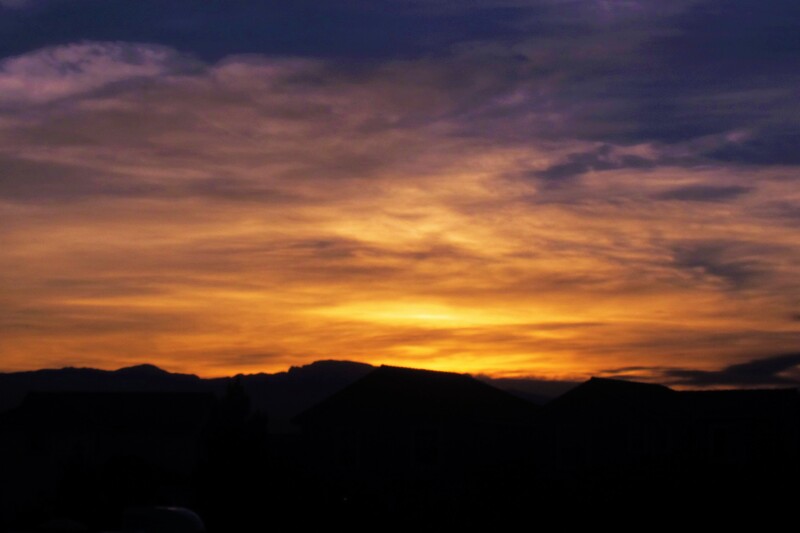 Kit and I were able to time it just right to view the sun setting over the western mountains as the lights of Las Vegas came to life! It is a whole different experience riding through the Nevada night sky. But just as awe-inspiring and enjoyable as the first time! 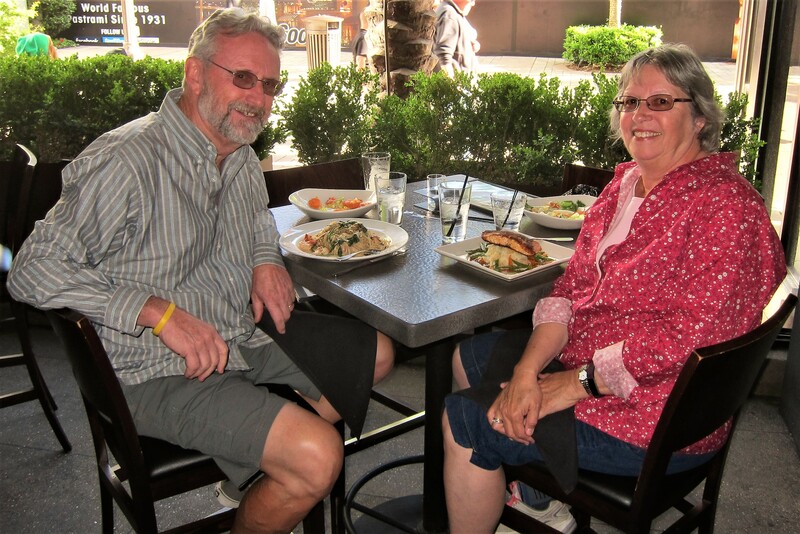 What a great way to spend my 70th birthday…thanks Kit, for accommodating my wishes! Thursday, April 6, 2017: Departed Desert Eagle RV Park on Nellis Air Force Base at 1120. 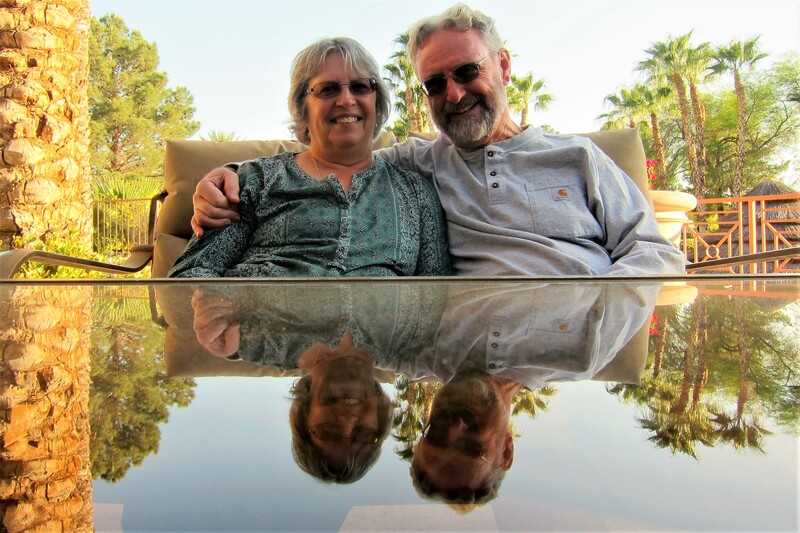 Hopped on Interstate 15 for the short 21-mile trip south toward our next camping opportunity…Oasis RV Park, a spot we have enjoyed many times in the past. 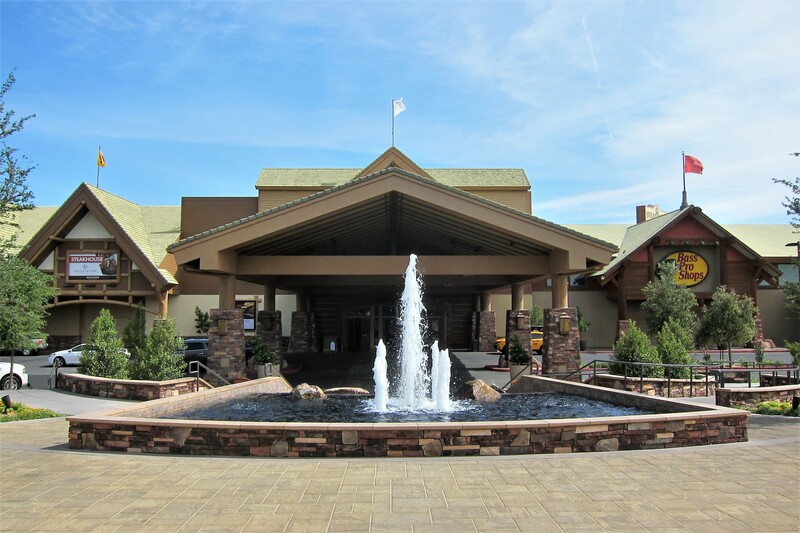 We asked for, and received a deluxe site in order to be close to the clubhouse and pool area. In addition, the space is larger than the standard site and features real grass…a unique commodity in the arid desert! 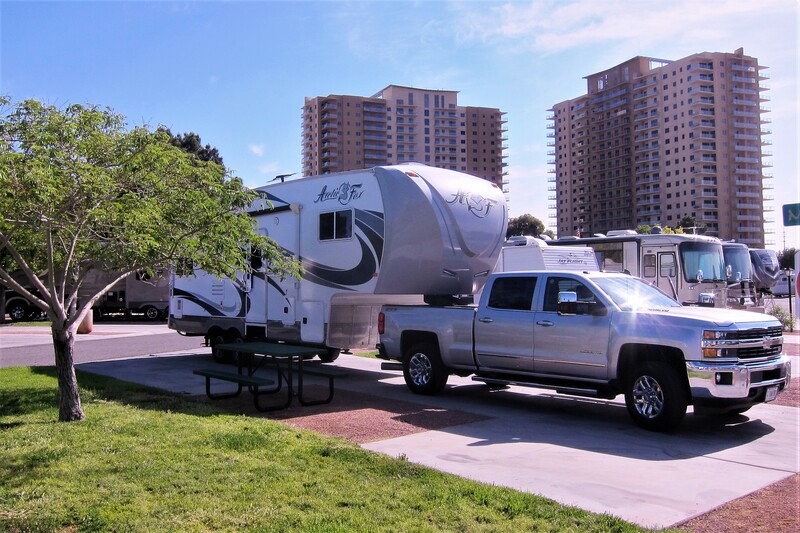 The main reason we relocated just a short distance away and to an RV Park that costs three times as much, is location, amenities, and location. 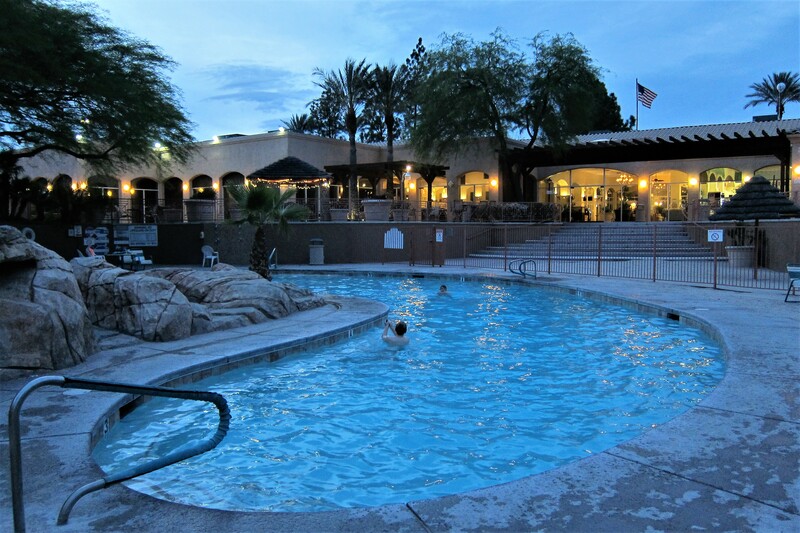 Oasis RV Park is a mere five minutes from the kids’ house and it has a nice swimming pool! Which the boy’s enjoyed frolicking about in until late in the evening. Also, since spring break for Jack and Tucker begins tomorrow, we wanted to start the adventure early while their parents enjoyed some time off as well. 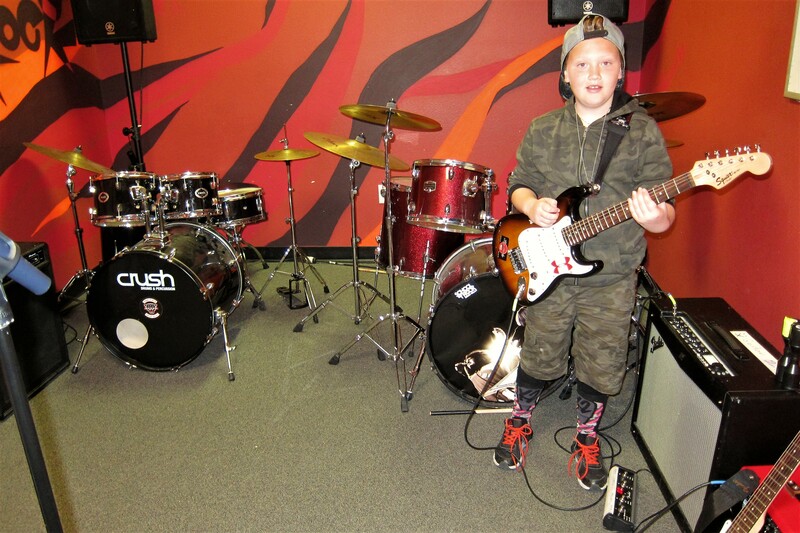 To this end, Kit and I volunteered to take Tucker to his electric guitar lesson at the School of Rock. Where we got to sit in on a jam session and enjoy him performing classic rock songs on his Fender. 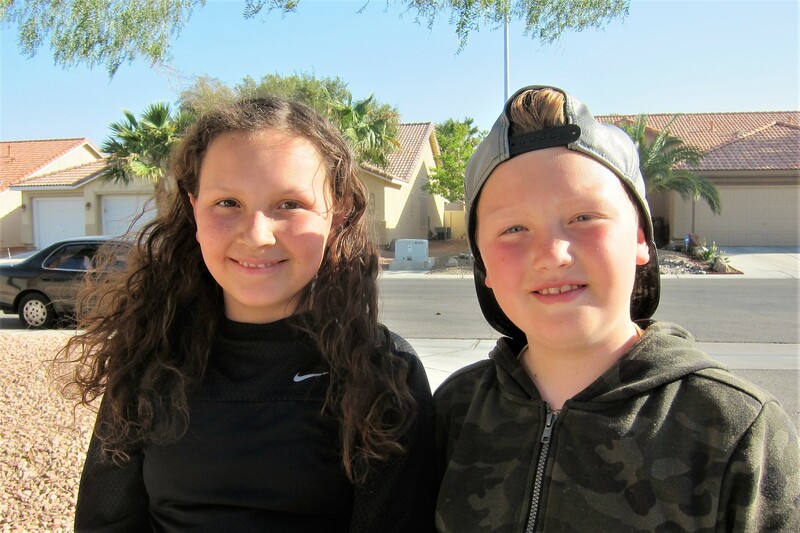 We also hung around the neighborhood and met some of his schoolmates. Faith is one of Tucker’s best friends, and they seem to hit it off very well! 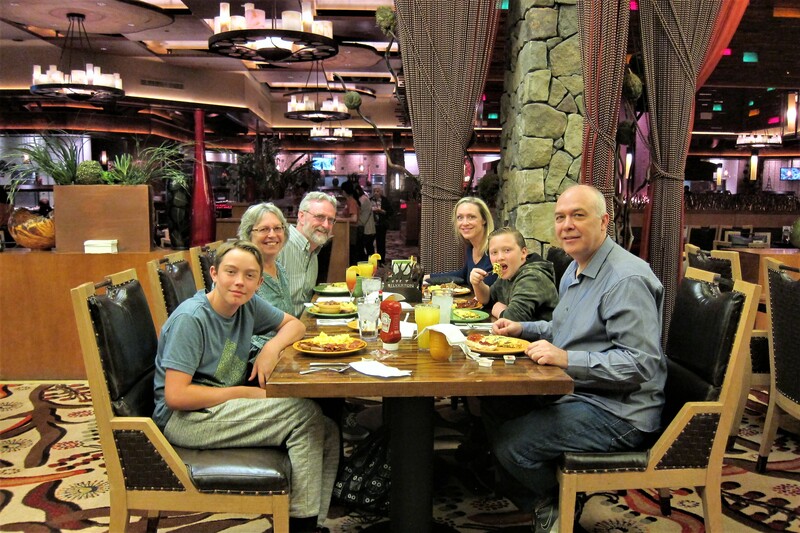 On Sunday, which was Kit’s birthday, the whole family gathered at the Silverton to enjoy a fabulous brunch. The food and the company was very enjoyable! 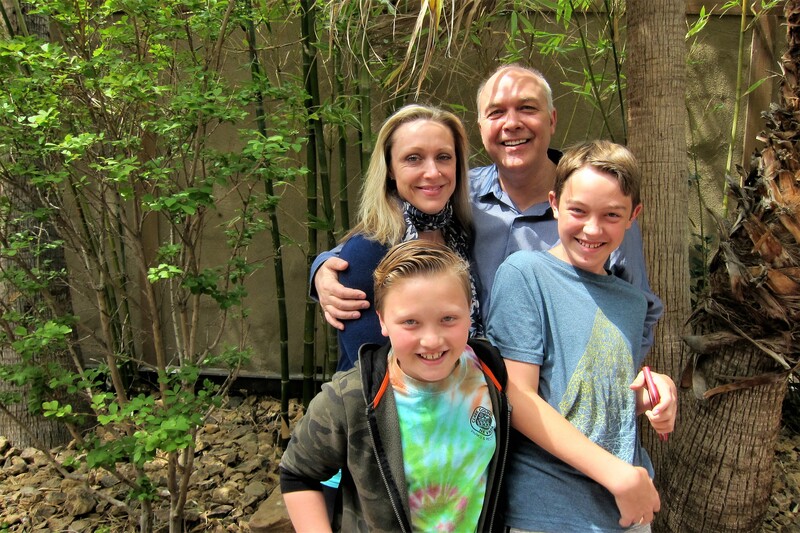 And as a special birthday treat for Kit, I was able to snap a few photos of daughter Suzie, son-in-law, Kevin and the boy’s…Jack, age 12 and Tucker age, 9 and 9/10ths. Since this is the final evening before we take the kids on a weeklong camping adventure, they wanted to sleep in their own beds. So, Kit and I returned to the RV Park, and readied for an early morning departure. We also walked about the park a bit where we noticed this interesting RV and matching trailer. That’s about a million dollars of motorhome and car-hauler trailer there folks, taking up two expensive RV sites. Rumor has it that the trailer contains two exotic supercars, one of with is reported to be a Lamborghini! No sign of the owners was detected during the time we were there…must be nice to have the big bucks!?!? Stopping by the pool, we sat and reflected (pun intended) on the day. 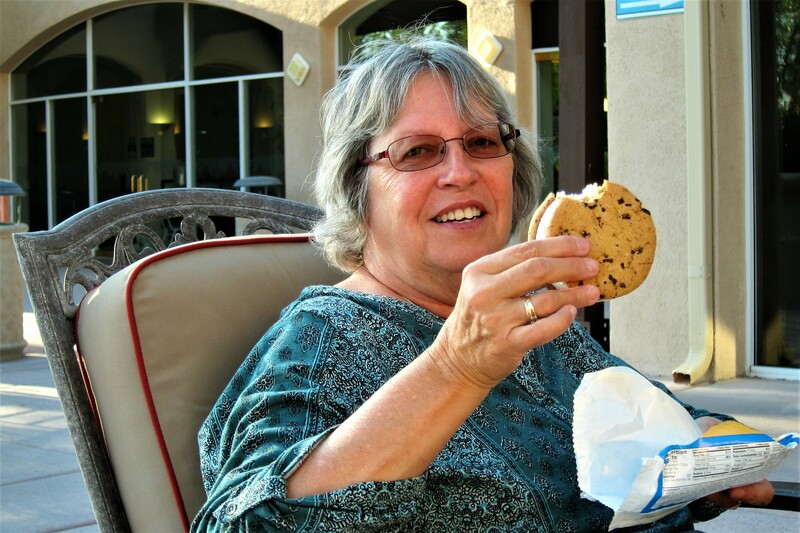 And discussed the upcoming grandkid camping trip while indulging in a birthday treat. 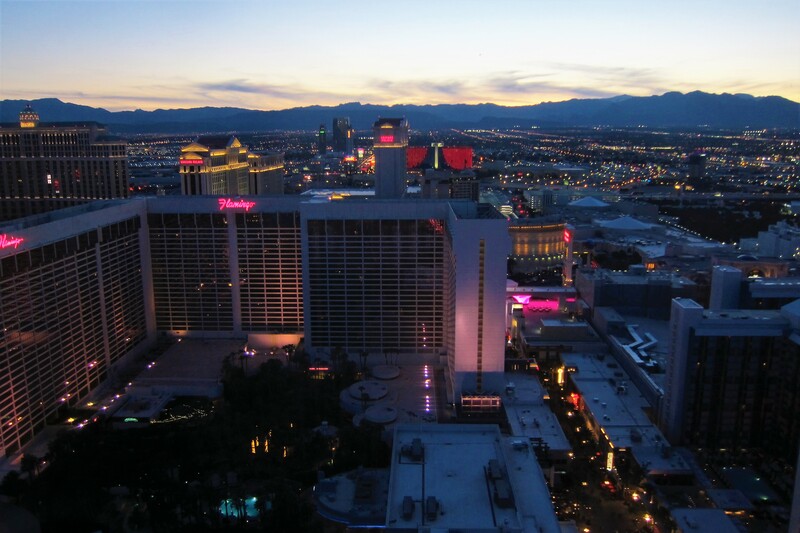 As night fell on the entertainment capital of the world, we bid you a pleasant goodnight. Stay tuned for “Jack and Tucker’s Excellent Spring Break Adventure” coming soon to a website near you. Gumbo’s Briefs (pun intended): Well, suddenly, I’m Gumbo! When our two youngest Grand Boys were small, they came up with this name for me. Since my original name is Guma, from our oldest Grand Boy, Joe, when the younger two are in Maine, all five Grands call me Guma. In Las Vegas, they call me Gumbo. 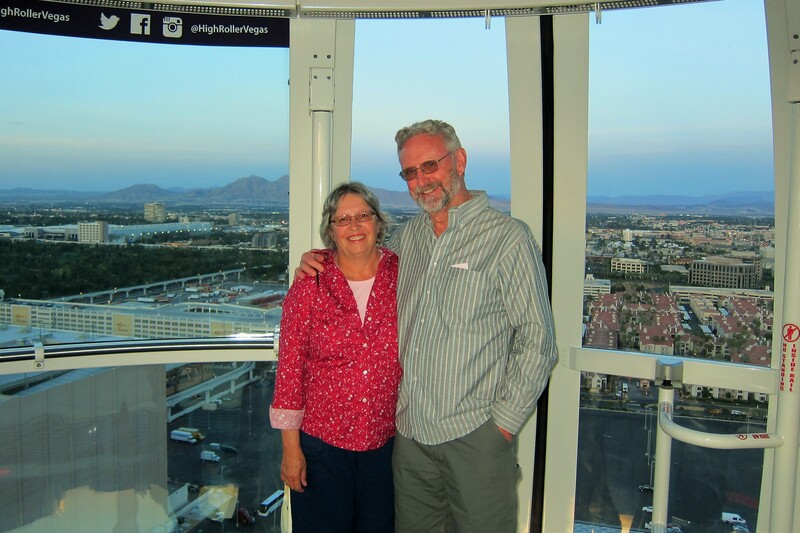 We thoroughly enjoyed Bill’s 70th Birthday, and riding the big Ferris wheel. 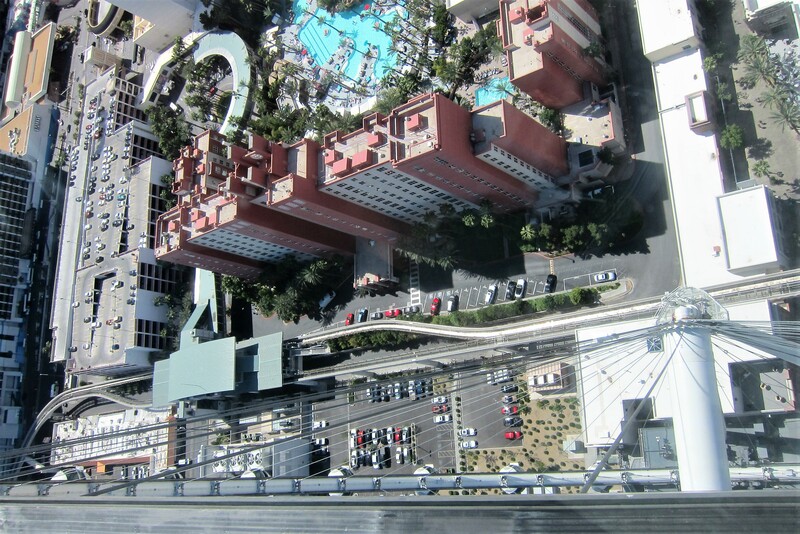 I wasn’t too keen on it at first but, it was so smooth and provided the most awesome view of Las Vegas! It was also fun to ride it at night, too. Even more spectacular! Only thing I can’t quite get used to is, 70? How did this come so quickly???? Miss you guys! See you soon! Miss you as well…may see you sooner than you think! Wow! 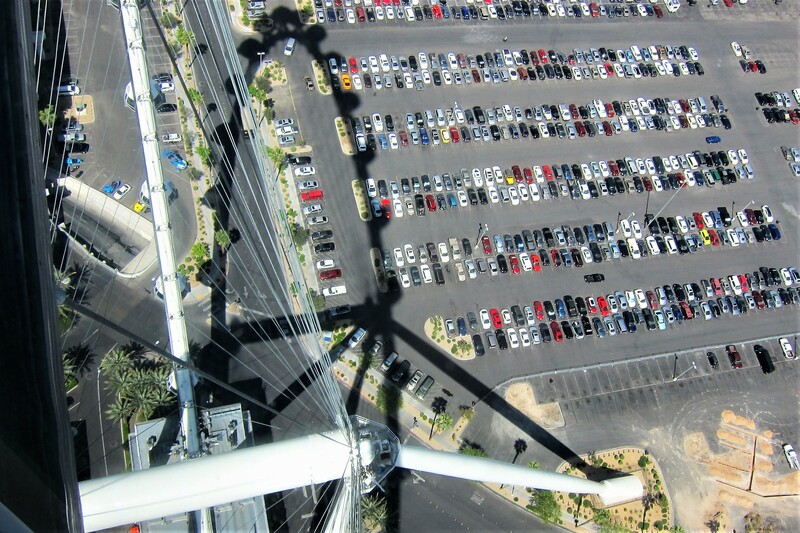 550′ tall Ferris wheel! Made me dizzy just looking at it…wouldn’t have stopped me though! Would have loved the night trip on it! Sounds like you both had great birthdays..! Jack and Tucker are getting big and look so happy…..”Gumbo”, good choice on the birthday treat! 70 looks good on both of you! Thanks, sure don’t feel, or act, 70! We are currently east of the Mississippi River and homeward bound. Never can tell when we might show up at a dance, but when we do, look forward to seeing you!! PRETTY SPECIAL WAY TO CELEBRATE THE BIRTHDAYS. WISH THE MERRY GO ROUND WAS THERE WHEN I VISITED BACK IN THE 70S AND 80S. 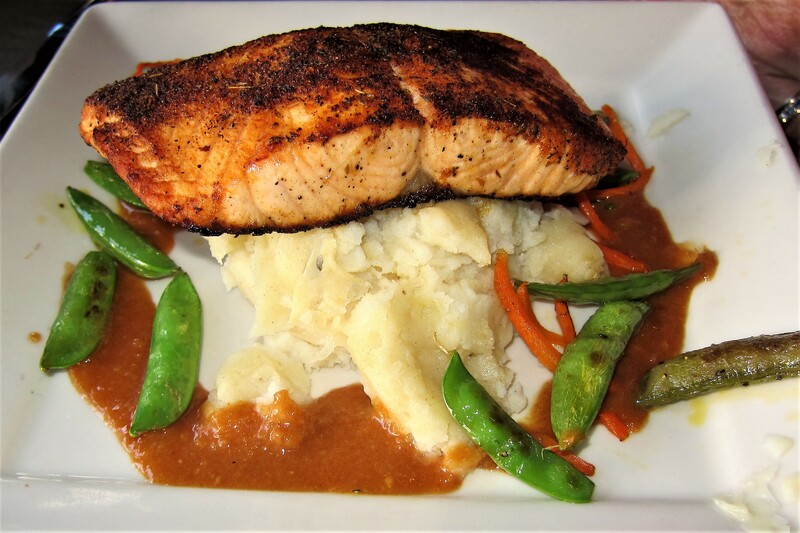 WE KNOW HOW SPECIAL IT IS TO ENTERTAIN THE GRANDKIDS AND VISIT WITH FAMILY. LOVED ALL THE BEAUTIFUL COLLECTORS AUTOMOBILES. CODY JR AND I FISHED SEBAGO SATURDAY, VERY WINDY AND COULDN’T GET TO WHERE THE FISH ARE FEEDING ON SMELTS!! Hi, you guys need to come out and fish the lake this summer! Hi folks: So your adventuring continues! Know you had a special time with the grandkids…that Tucker has really grown since we were visiting in Maine in 2013! Have a great trip back home, and a safe one! No! You CANNOT get me to get on the ferris wheel EVER! But know you had fun doing that. Take care, and stay safe! Thanks folks, see you next summer! Bet that was a thrill to see! Must of been a rally of some sort. Headed home batteling rain and wind…might have left the Southwest a bit too soon this year!?!? Looking forward to seeing you folks as well. Don’t rush home——the weather is cold and rainy, with a stellar sunny day here and there. Keith says this will last another 10 days or so. The ferris wheel overlooked some awesome sights, but you won’t get me on one!! Too late…already in the upper Midwest and it is cool and rainy here as well! 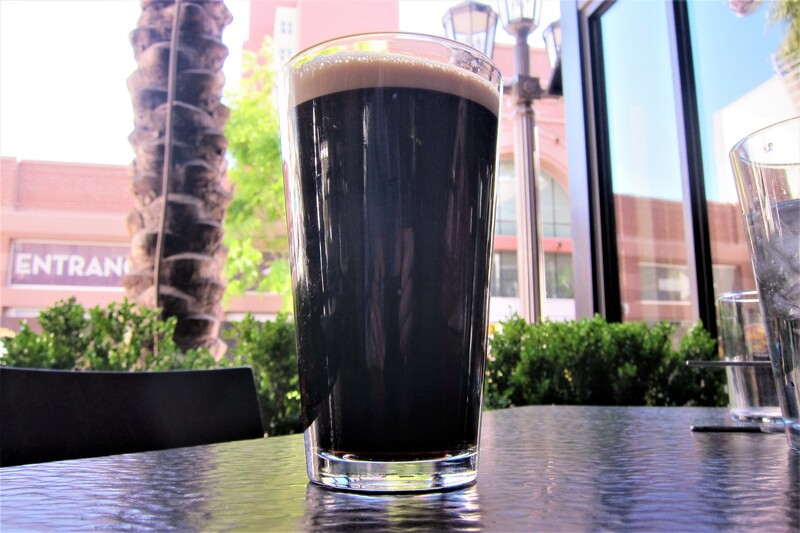 Yards of beer are my kinda yards…and they pair nicely with Fish Taco’s! It’s a race! Who will cross the Piscataqua River first?!?! Have an enjoyable, and safe trip home!